CLEMSON, S.C. — The Clemson Tigers practiced for nearly two hours on the fields beyond the centerfield fence of Doug Kingsmore Stadium on Friday afternoon. Dabo Swinney’s team begins its season two weeks from Saturday against Wofford in Memorial Stadium. For the first time, Swinney had his team divided into a varsity and scout team as the true preparation for a specific opponent began. After practice, Swinney watched over 35 prospective walk-ons try out for a few spots on the 115-man roster. “It was a typical first day of game preparation,” said Swinney. “A was a little sluggish at times, but we will have another day of it on Saturday and then on to Monday.” The team will practice Saturday morning and hold Fan Day on Sunday at 2:30 p.m. in Memorial Stadium. 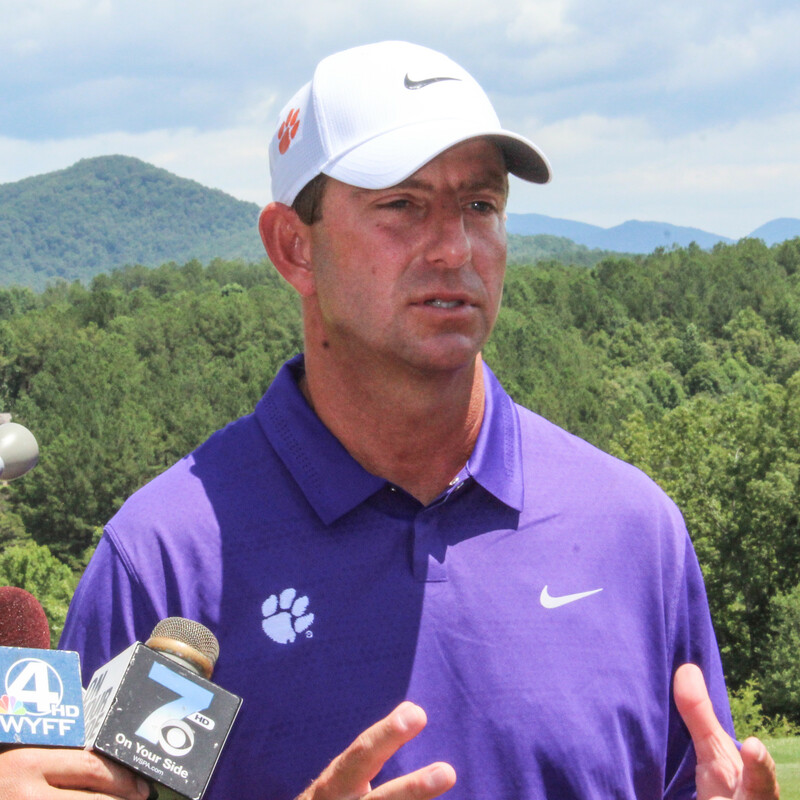 Swinney was asked about whether or not some of the other first year players would redshirt. He did not give a list of every freshman that would play, but did answer questions from the media about specific players when asked. The seventh-year Clemson coach said that the plan is to play quarterback Kelly Bryant, wide receivers Deon Cain and Ray-Ray McCloud, linebackers J.D. and Judah Davis, and Jalen Williams, offensive linemen Mitch Hyatt and Jake Fruhmorgen, defensive linemen Austin Bryant, Albert Huggins and Christian Wilkins, defensive back Van Smith, and tight end Garrett Williams. Other true freshmen could play as the season goes on, but many are “on the bubble” at the present time. Choice played in six games last year before suffering a torn ACL at Boston College. He rushed for 218 yards on 50 carries, including a team-best 61 yards against a Louisville defense that had a national high six players drafted last year.